Walking is safer than flying. 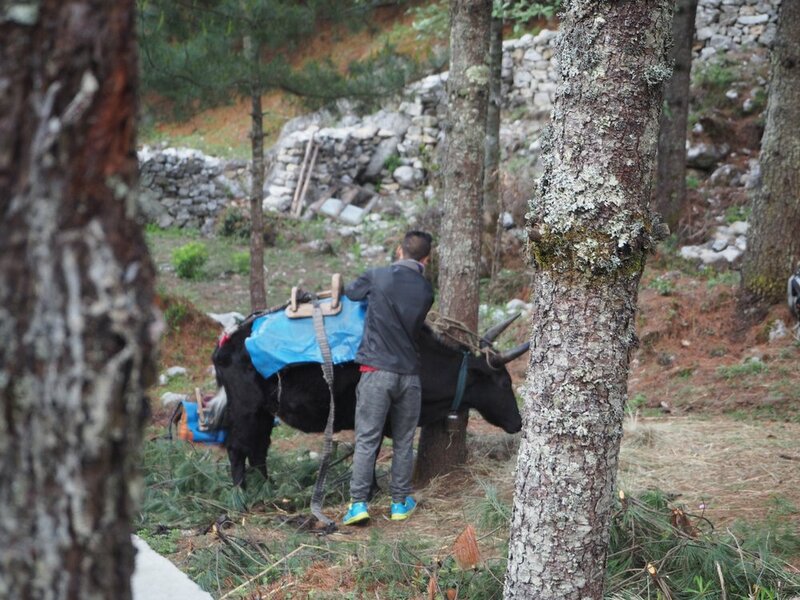 Our walk from Lukla (2840m) to Phakding (2610m) was meant to take 3 hours. We left Lukla a little later than planned, then had to stop and take photos of the amazing scenery every ten steps or so. In a classic Pete move, Dan instantly lost his brand new sunglasses, leaving them on a bench less than half an hour from Lukla. He realised about 20 minutes later, but nobody wanted to walk up hill to retrieve them. I only had enough water for an easy down hill 3 hour stroll, but this turned out to be a little more effort and I had to buy an extra litre of water when we stopped for lunch (which still wasn't enough but I have since learned my lesson). We ate at a restaurant perched on the side of the mountain, overlooking an amazing valley. The sun had come out shortly after we left Lukla (so the remaining flights for the day landed in perfect weather) and we sat in the restaurant's courtyard baking in the hot sun and cursing the stupid roll on sunscreen that we thought at the time of purchase would be very convenient on a hike. I'll be writing a letter of complaint to the Cancer Council upon my return to Melbourne. We eventually moved inside and ate some seriously delicious Dal Bhat, a lentil dal served with rice, cooked oniony spinach and papadams. The meat eaters of the group also got a very boney chicken curry. I wasn't hungry at all, and panicked a little when I saw the serving size, but once I started eating I pretty much finished the whole plate in about 5 minutes. Good food. Our guides double as waiters when we stop at restaurants for tea or lunch, or at our guest house for dinner. If you order the Dal Baht they come around with plates of extra rice, dal and spinach and top you up. Bonus good food. After lunch a little girl entertained us by drawing all over the walls in crayon and showing off a letter she was writing to her dad. 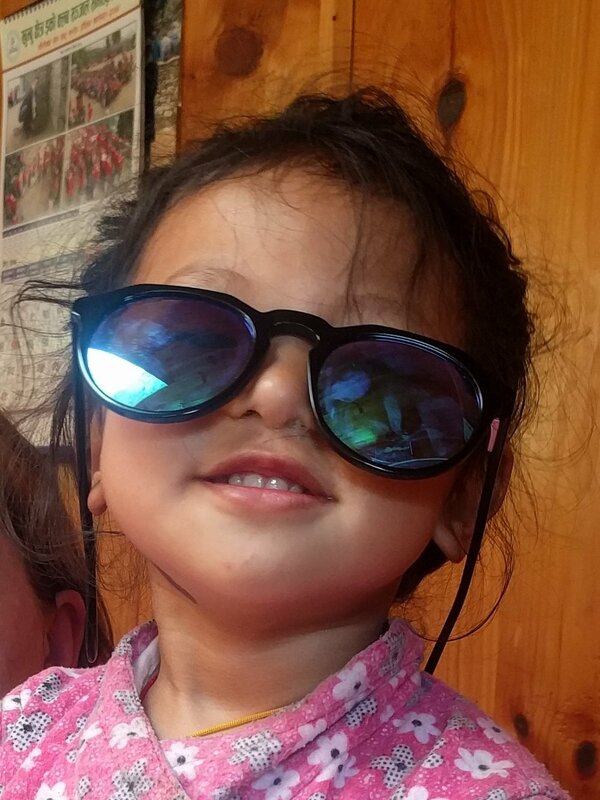 She was smitten with Paul's very reflective sunnies and played with them constantly. She also went around to every backpack and attempted to close all the buckles. Very cute. We retrieved our possessions from the tiny child and waved goodbye, and continued to head into the valley. We passed through the main village of Phakding and crossed our first suspension bridge. Picture a narrow metal trampoline suspended over a gushing river. A little more walking brought us to an amazing guesthouse relatively isolated from the town, by around 4pm. The guesthouse was brand new. Pete learned from the owner that it was also brand new in 2015, shortly before it was flattened by the earthquake. They had only recently finished rebuilding it. Unbelievable. The entrance of the lodge took you into a foyer reception area, with comfy couches and beautiful wide raw pine floorboards, and benches to stow your packs and trekking poles. We were offered tea and coffee and then changed our hiking boots over for the guesthouse provided masseuse sandals. The bumpy souls were very very satisfying to our sore feet. Our room was really comfy and overlooked the front of the property, over a lawn and into the field where our yak-cow hybrids were resting, having carried the bulk of our gear down from Lukla. I think they'll be with us for the whole trip. We settled in and enjoyed dinner together in the guesthouse's restaurant. Dan, Paul and I then rugged up and went outside to try and take some photos of the stars. Sadly, there weren't any.